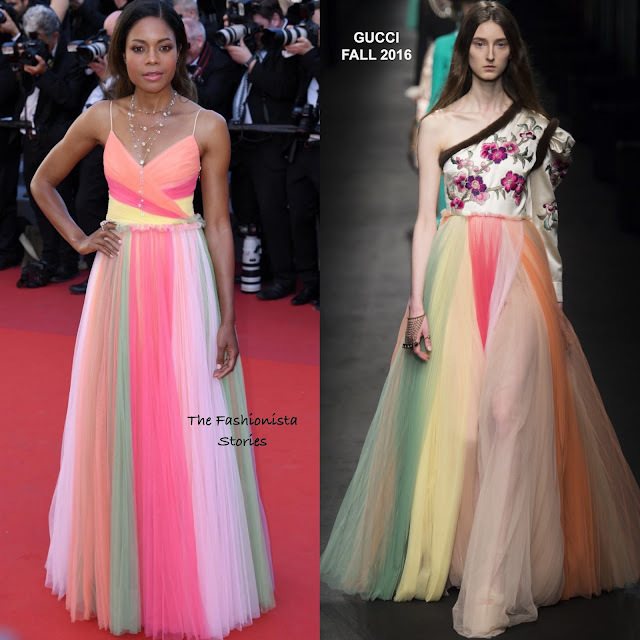 On hand to launch her collaboration with Swarovski, Naomie Harris hit the red carpet this at the 'Ismael's Ghosts' premiere & opening ceremony during the 70th Cannes Film Festival at Palais des Festivals in Cannes, France. For the occasion, she stood out in a custom GUCCI FALL 2016 color-block tulle floor length dress with spaghetti straps and a v-neckline. Naomie's exact dress wasn't shown on the runway, the skirt was shown with a different top. However Naomie's modified version is much preferred and suited the occasion. Also I love the colorful combination. ATELEIER SWAROVSKI jewelry, off-the-shoulder tresses and a smokey eye offset with a glossy lip finished up her look.